Xenia sophomore Aydan Evans slides into third before racing to home plate for the run following a Greenon error, to put Xenia up 1-0 in the third inning of Wednesday’s March 27 game in Xenia. Xenia Senior Warren Mahar winds up to throw a strike against the Greenon Knights in the top of the third inning. 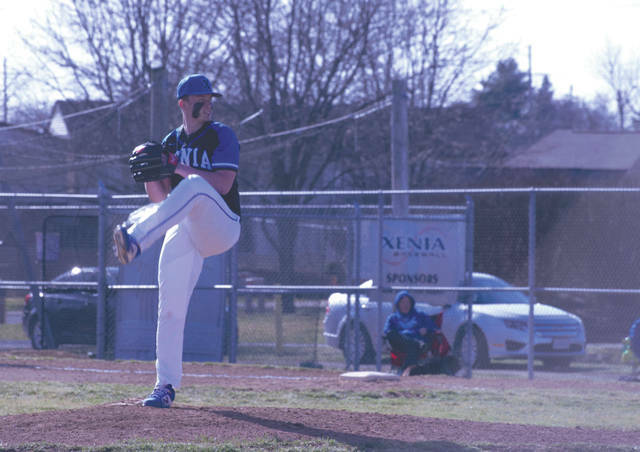 XENIA — An explosive sixth inning led to a 4-0 boys high school baseball home victory for the Xenia Buccaneers over the Greenon Knights. The win brings the Bucs to a 3-0 record. They have only allowed one run in the three games they have played. The Bucs had six people get on base (five hits, one walk) and scored three of their four runs in the bottom of the sixth inning. Xenia coach Barry Claus highlighted the work of his only freshman, Aaron Adkins, who delivered an RBI single to help seal the game. Aydan Evans, Andrew Pollander, Alex Sparks and Ben Hatfield (run in by Dylan Hall) scored the runs for the Buccaneers while pitcher Warren Mahar picked up the win. Just before Xenia’s big sixth inning, they had to get out of a jam in the fifth. The Knights were down by one with the bases loaded looking to take the lead. Xenia pitcher Blayne Dudley managed to get his team out of the hole by getting the third out on a strikeout to end the inning. The loss was Greenon’s first of the season. The Knights responded with a 9-0 win at South Charleston Southeastern on Thursday, March 28 to raise their record to 3-1 (1-0 Ohio Heritage Conference). Claus said he was happy with how his team responded to the pressure, but there was definitely things they needed to continue working on. Xenia will next play at 11 a.m., Saturday, March 30 at home against Chaminade Julienne. 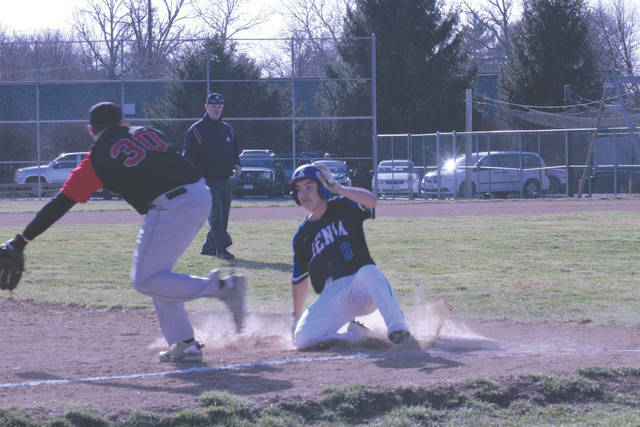 https://www.xeniagazette.com/wp-content/uploads/sites/32/2019/03/web1_AdkinsSlide_PS.jpgXenia sophomore Aydan Evans slides into third before racing to home plate for the run following a Greenon error, to put Xenia up 1-0 in the third inning of Wednesday’s March 27 game in Xenia. https://www.xeniagazette.com/wp-content/uploads/sites/32/2019/03/web1_MaharPitch_PS.jpgXenia Senior Warren Mahar winds up to throw a strike against the Greenon Knights in the top of the third inning.